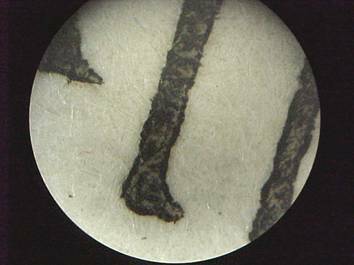 Due to the way that relief prints are made, the ink has a distinct look under the microscope. The printing often has a dark rim around the edge of the ink. In cases, this can be seen with the naked eye or ordinary magnifying glass. This rim appears on all types of relief prints, both hand made and photomechanical (see photoengraving in later chapter). The only non-relief print that sometimes has a similar rim is early chromolithography (a colorful form of lithography). However, this rim in chromolithography is cause by the settling of the thin lithographic ink and will appear more irregular than mechanical. In relief printing the ink is most apparent on smooth, glossy paper. If the paper is rough, such as with newsprint or hand made paper, the rim may not be a noticeable. As a relief print is made by the pressure of the printing plate against the printing surface, some relief prints will have an embossment on the back of the paper. This can often be felt with the fingertips and seen. If the paper is thick or there is printing on the back, such as with the pages of a book, the embossment may not be apparent. The following pages, briefly cover the major types of hand made relief prints. The relief print called woodcut is both the name for the printing process and the print itself. The artist or craftsman carves the design into the plank side of the wood using chisels, gouges and similar tools. The woodcut is an ancient form of printing, used in ancient China. It flourished in Europe after the 14th century. During the 17th and 18th century the Japanese made many influential woodcuts. The woodcut was commonly used for commercial prints until the mid 1800s, when it was replaced by wood-engraving, a finer type of woodcut. The woodcut has used by many famous artists, including Albrecht Durer, Pablo Picasso and Salvador Dali. Identification. Along with the dark rim around the ink that is typical to relief printing, the woodcut is identified because of the distinct and often primitive lines .The white areas are the result of the wood being scooped from the block. If you can imagine the white areas being scooped out, then this is a strong indication it is a woodcut. Two other types of prints can resemble the woodcut: wood-engravings (a form of woodcut, linoleum cut and photoengraving (photomechanical primarily used for mass production). Due to the natural irregular shape of the wood, neither the woodcut nor the wood-engraving can print large areas of solid ink without showing the grain or irregular shape of the wood. To simulate large areas of solid color, a series of parallel or cross-hatching lines was made. These lines will appear as white light lines against the area of otherwise solid ink. The linoleum cut often closely resembles a woodcut. One of the most noticeable differences between the two is that the linoleum cut can print large areas of solid ink. Wood-engraving is a form of woodcut that largely replaced the woodcut for mass production commercial purposes in the mid 1800s. It was the common way to make pictures for newspaper and magazines until the 1890s when it was slowly replaced by photoengraving. 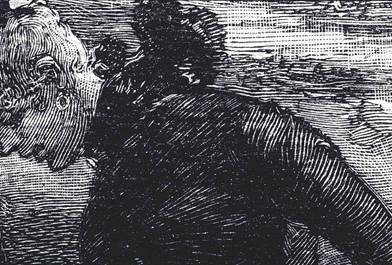 In the fine arts, wood-engravings are still made today. A harder wood is used than with the woodcut, and the artist carves across the grain of the wood ('end-grain'). This allows for finer and more detailed lines on the block of wood and in the resulting print. Identification: As with all relief prints, the wood engraving has the hard rim around the ink that can be viewed under the microscope and sometimes with the naked eye. The wood-engraving can closely resemble the woodcut in general appearance, except that the wood-engraving is more detailed with finer lines. If the white line is thin and delicate, it is most probably a wood-engraving instead of a woodcut. It was not possible to create such a fine line in the woodcut. Due to the natural irregular shape of the wood, neither the woodcut or wood-engraving could print large areas of solid ink without showing the grain of the wood. To simulate large areas of solid color, a series of parallel or cross-hatching lines was often made. There are various hand made relief methods that use metal instead of wood. The most frequent method is to cut a metal plate in the same way as cutting wood. This was frequently done from the fifteenth to nineteenth century often for decorations, such as border designs in for book illustrations. With some early prints it is impossible to determine whether a print was made by wood or metal. In the fifteenth century, the outline of the design was often engraved, then the area within stamped and punched. These are called manière criblée or 'in the dotted manner' and have a distinct, primitive look. The British poet and printer William Blake made the pictures for his books using an etched metal plate printed in the relief form. The prints were either printed in color or hand-colored, and original prints have unique color variations from book to book. The linoleum cut, also known as linocut and linoleum block, is a 20th century invention. Through introduced at the beginning of the 20th century, it was not popularized with artists until Pablo Picasso and Henri Matisse used it in the 1950s. Since then, it has been commonly used by artists. The linoleum is made just like a woodcut, except a block of linoleum is used instead of wood. Linoleum is cheap and, unlike wood, easy to cut. Many of us have made linoleum cuts in school or at home. 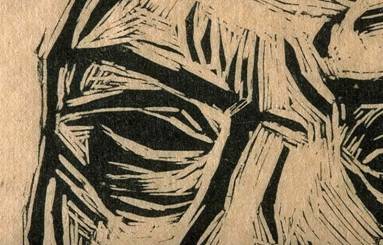 As linoleum is easier to cut, a linocut can have many different effects and lines not possible with woodcuts. Linoleum cuts often look like woodcuts. It is sometimes difficult to tell if a print is linoleum cut or a woodcut. As with most relief prints, the linocut has a noticeable rim around the ink. Due to the smooth surface of the linoleum, linoleum cuts can print large areas of solid ink. This is unlike the woodcut, which cannot print large areas of solid color. There is a wide variety of relief prints that you can make at home, using a variety of materials. This section is an introduction to a few common forms and techniques. It will introduce the concept of color printing and reductive printing color. The potatocut, often called a potato print, is probably the simplest and easiest relief print to make. They can be made by both adults and kids. As potatoes are soft, only a butter or plastic knife is needed to cut the design into the potato. Despite its seeming simplicity, a wide range of designs and prints can be made. 1) Cut the potato in half. Make sure that the cut surface is as flat/smooth as possible. 2) Using the butter or plastic knife, cut your design into the surface. Some people prefer to draw the design into the potato surface. When carving, the surface that is left behind will be what is printed and the design on the potato will be printed in reverse. So if you want to print your initial, you will have to carve it is backwards. This cut surface is the printing surface, or where the ink will be added. Since it's only a potato and you likely have others available as backups, start with a simple design to see how it works. As the printing surface of the potato is probably wet, dry it off with the paper towel. Extra moisture can interact with the ink or paint. 3) Put your desired color of ink or paint on a paper plate. 4) Either press the potato into the ink/paint, or use a brush to paint the ink onto the printing surface. 5) To make the print, press the inked printing surface to the paper, like you would do with a rubber stamp. Press firmly, to make sure enough ink gets onto the paper. Make sure to not smudge the print. Lift the potato and you have made a potato print. 6) If you don't like the way the print works out, try it again with the same or new ink. If you don't like the design, either carve some more into the potato or try with a new potato. You can mix and match your different potato designs and colors to make a wide variety of designs. You can also add hand coloring, to fix mistakes or add details (this would now be called a 'potatocut with hand coloring' or 'mixed media potatocut' because you have mixed the potatocut with hand coloring). Potato cuts are great for kids to make greeting cards and even T-shirts. The traditional way to make a color print is from multiple printing plates, one plate for each color. You can make a color potatocut this way. To start, you might wish to make a two color potatocut, from two potato halves. Before carving your design, you should think about what colors you want and what designs you will make. It's usually best, at least when beginning, to start with the background in a light color, then, the second print will be the details. For example, the first potato half may print a solid light blue background, perhaps with a small cutout cloud in the background. The second print then might print a black tree or dog or whatever. Most printers will wait for the first color to dry before printing the second color. Others like the effect of printing while the first color is still wet. Once you have your two potatocuts, you can print as many prints as you wish, including in different color combinations. Some artists will add a bit of hand painting, in order to add details or fix printing mistakes. In reductive printing, there is only one printing plate (one potato half). After using the plate to print the first color, the artist carves out more of the plate and prints the second color, then carves more of the plate and prints the third color, and so on for each additional color. Especially with complicated designs, this type of printing takes great planning, because there is no turning back. There are reasons an artist makes reductive prints, other than the fun and challenge of it. One is that you don't have to deal with the hassle and cost of making several printing plates. Also, since you are working from a single plate, carving away as you go, it is easy to make sure your deigns and proportions match. 1) Cut the potato in half. The cut surface should be as smooth/flat as possible. Use the towel to wipe off the extra moisture, as the water may not interact well with the paint or ink. This flat cut surface is the printing surface' meaning where the ink will go. 2) This smooth surface will be your first color, giving the background color. Add a light color ink or paint to the printing surface, like yellow or beige. Press the printing surface onto the piece of paper, making sure not to smudge the print. You should make a few prints, adding more ink if necessary. Remember, since this is a reductive print, there's no going back if you make a mistake. 3) Remove the ink from the printing surface and carve out part of the printing surface for the next color. Add the second color paint or ink to the new printing surface. The color should be darker, like blue or red or green. Press the printing surface over the first color. Make sure that everything is lined up and the potato is in the same position (top of design is on top again, etc). If you make a mistake lining up the print, you will realize why I recommended you make more than one print at the start. 4) Remove the ink from the printing surface and carve away more of the printing surface. This last printing surface will usually produce the dark outline or other last details. Add black or other very dark ink to the surface and print this on the paper. 5) You have made a reductive print. Relief prints can be made from a variety of commonly found material, including wood, linoleum, cardboard, erasures and other vegetables. All of these materials can be cut or altered in similar ways as the potato. You can also relief print many ready-made printing plates, including old coins, bones, stones and keys. Linoleum is commonly used in the fine arts. It is relatively inexpensive and easy to use. Linoleum comes in sheets or in blocks (a sheet of linoleum pasted to a block of wood). To put your design into the linoleum, you will need special linoleum cutters. These are handheld tools with different sized heads. They can be bought in many art and craft stores and catalogs. You may also wish to get an ink roller, which is a hand held roller that evenly applies the ink. As linoleum is larger, smoother and harder, you will find you can made more intricate and larger prints than with the potato. At this point, you will probably find it best to print in a different way than with the potatocut. Instead of stamping you printing plate down onto the paper, you can press the paper down onto the printing plate. With the paper onto top of the inked printing surface, even apply pressure by rubbing your hand, towel or a tool called a brayer. You then remove the paper, by slowly peeling it from one corner. It you lift it suddenly straight up, the ink might smudge. A woodcut is made in basically the same way as a linocut, except wood is used instead of linoleum. Special cutters for wood can be bought at stores. When cutting the wood, it is not necessary to cut deeply into the wood to make a print.